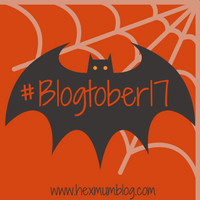 Well, here it is, my first ever Blogtober! Sod’s law means that we have had a busy week so I’ve not prepared in advance and we go on holiday tomorrow, making it even more of a challenge. But, here I am, giving it my best shot, so we will see how it goes. The first pointer is “All About You”. I was trying to think what to write that I haven’t already told you. So instead, on a variation of the theme, I’m going to tell you ten random facts that you probably don’t already know about me. 1. I grew up in the Midlands. I was born and brought up in and around the Black Country, an area famous for its contribution to the industrial revolution. My Grandad was a very proud Black Country man, who would regale us with tales of all the many interesting jobs he had done in his life. That awkward bit in the middle of the country that’s neither “Up North” or “Down South” and has some of the worst accents, but I’m a Midland girl and proud. 2. I went to an all-girls grammar school. I somehow passed the exam to gain entry when I was off school with the flu. In some ways it was a good place where I learned a lot and which set me up well for going to university. I also hated it. The pressure, the expectation, not being important if you weren’t planning on going to Oxford or Cambridge to be a doctor, dentist, lawyer or vet. I don’t know if I would ever send my children to a similar school – I don’t know if the pros outweighed the cons in the end. 3. I studied five foreign languages. French, Russian and Latin from year 7, Spanish for GCSE in years 10 & 11 and lunchtime classes in Italian. Note that I carefully worded it as “I studied”, not “I speak”. Sadly, I can’t remember very much of any of them (I’m not sure knowing how to say “apple” or “guinea pig” in Russian is going to get me very far in life). Although it’s a dead language, I would definitely say that Latin was the most useful thing I ever studied. I can read many other languages, at least enough to get a decent understanding of what is going on, just through what I remember from my Latin lessons. I’d actually recommend it as a subject and would encourage my children to study it int he future if they had the opportunity. 4. I met my husband during our first term of university, aged 19. We’ve been together ever since. I sometimes wonder if I missed out on living with or holidays with friends or any other experiences by meeting him so young, but I think what we have is worth much more than any of that. I’m lucky to have met a man like him so early in my life so we have so much time ahead of us to spend together and make our memories. 5. We got married when we were 23. When we got engaged at 20 there were a lot of family who weren’t overly impressed and friends who said it would never last, that we wouldn’t even get as far as being married. We proved them wrong, and we continue to prove them wrong every day. Next year it will be our fifth wedding anniversary and our tenth anniversary of being together. That being said, now we have our son I’m not sure how I would feel if he wanted to get married at the same age. It may be hypocritical, but I think I can understand some people’s’ concerns about it more now we have him. 6. We’ve lived in six different houses in four different places. We have moved A LOT. We lived in two different houses in our university town, another in a nearby town after university, we then moved almost 200 miles away to a city we loved where we rented a flat, then bought our first house, and now we’re in the Isle of Man in the second house we have owned together. I’ve thrown the moving boxes away now. 7. I’ve performed since the age of three. I performed in my first dancing show in a large theatre at the age of three, and since then I’ve danced, sung and acted in around thirty different shows. From the age of 17 I didn’t do any performing at all, but this year, a decade on, I’ve taken it up again. There are some amazing amateur dramatic societies in the Isle of Man, and I felt like I needed a hobby that I just did for myself, so it seemed a shame not to take advantage of the situation. 8. I used to work in the music industry. I think that sounds a lot more glamorous than the reality. I spent most days doing paperwork, preparing invoices for studio time and running around West London tracking down ridiculous items you can’t buy easily outside America for high-profile artists. On the other hand, I played a big part in an element Coca-Cola’s corporate hospitality during the London 2012 Olympics, walked into (literally, into) Cheryl Cole, organised the album launch for a number one album by a very well-known artist and a rider I bought for another big-name artist appeared in the background of a scene in The Voice. So it wasn’t all bad. 9. I owned and ran my own music business. I ran it day-to-day, and my husband and I promoted local gigs and managed a band for just over a year. It was really good fun while it lasted, but ultimately it took up a lot of our time and we couldn’t continue doing it once we started a family. It’s definitely something we would consider going back to in the future, though. 10. I hope my relationship will be as incredible as my Grandparents’. My Grandad passed away a few years ago, but my Nan and Grandad had the most wonderful relationship. They met when they were fifteen, married at twenty, and barely spent a night away from each other. They were truly happy and in love. If my marriage is half as good as theirs then I will consider it a success. So, there you have it. Ten random facts about me. I hope you’ve found it insightful and feel like you know me a bit better now. If you have any interesting facts about yourself that you would like to share, I’d love to hear about them in the comments below or you can send them to me on any of my social media channels. Thank you 😬 I think it’s going to be a tricky week keeping on top of it all!